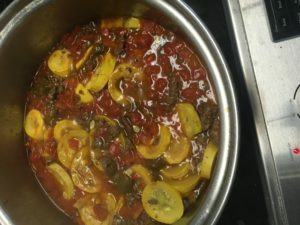 When I first found this recipe for Ground Venison and Squash Skillet Stew it did not sound good. 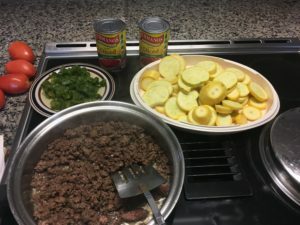 But since I had a bumper crop of yellow squash from the garden, lots of bell peppers that year, and a good supply of ground venison in the freezer, I tried it, and love it. I have been making it for years and have adjusted my recipe Try it, you should like it! Its easy and quick. I usually start in skillet then remember to put it in a pot for easier stirring. Brown ground meat in bacon drippings. Add sliced squash, chopped bell peppers, cans of tomatoes, salt and pepper. This entry was posted in Fishing Tackle on February 8, 2019 by ronniegarrison.